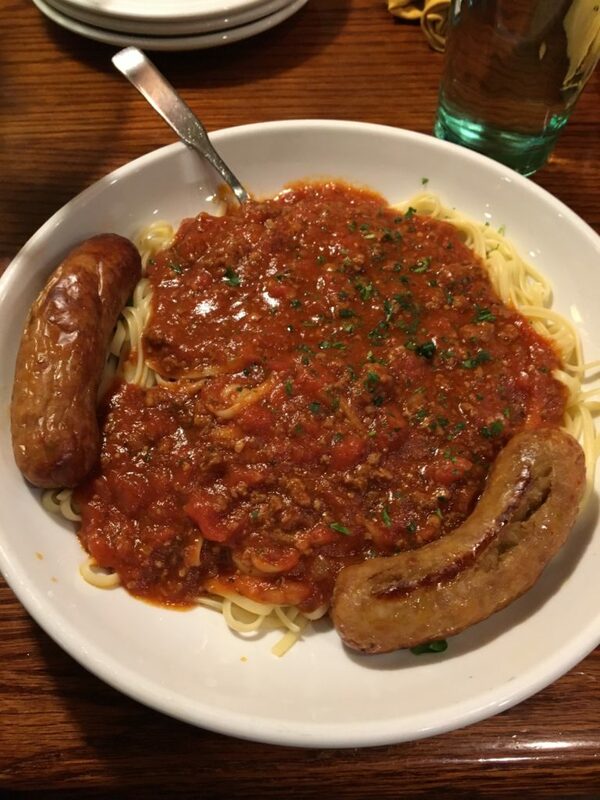 Today I was feeling crazy so I got a bowl of pasta with meat sauce AND sausage. It was pretty heavy. The meat was already sweating with grease and I wasn’t far behind. Nothing against meat, but I know it’s bad for you and carcinogenic and basically poison and raising livestock is destroying the earth and creating a dystopian future where desperate meat-seekers will be limited to the grasshoppers they can catch in their yards and the rest of us just say, wow, I’m just going to go with the veggie platter, I think. Do I feel bad when I eat meat? Physically, yes, but psychologically, less so. That shows you an inherent defect in my character, though, because raising animals to eat–even in the best of circumstances–is ethically kind of questionable. If animals were my only source of subsistence, I wouldn’t bat an eye (I might eye a bat, though). But, because of where I live and what’s available to me, there’s nothing compelling me to eat meat. Yes, I know, but you can get B12 from supplements. When I was studying ethics back in college (good thing I gave that pastime up, by the way), I learned something that stuck with me. When you start thinking about right and wrong, it’s easy to assume that things are right or wrong based on the effect they have on another. If I help somebody, they get something good out of that and thus it wasn’t a terrible thing to do. Conversely, if you hurt somebody else, you’re making their life miserable and that’s wrong. But it works the other way, too. If we are some kind of freakishly-literal Kantians, we might say that we can’t possibly DO evil to animals (like needlessly killing them and turning them into hot dogs) because you can’t do evil to a thing without consciousness/sentience/whatever. Like if you stepped on an ant, you’re not doing wrong because that ant is infinitely replaceable and it’s not self-aware, doesn’t have the same life experience, etc. However, the problem is that even if the other is not something we can “wrong” or “hurt,” we can still be hurting ourselves, which is wrong. If I torture a pig and eat it, even if we disallow that the pig is self-aware/unique/conscious/whatever, I’m still doing wrong or harm because torturing harms me. Even if I’m not physically hurt by my actions, I’m psychologically damaged by working cruelty onto another creature. A pig is certainly capable of suffering, and by inflicting suffering needlessly (again, hunting for subsistence is different, I’m pretty sure), I’m tormenting my own self. I’m not going to say everybody who eats meat should have to go raise it and slaughter it before eating it, but I have a feeling that would change a lot of people’s minds about eating meat. If I’m not the one inflicting the harm directly (it’s hard to harm a sandwich), it’s easy for my conscience to ignore everything that leads up to that point. You could make the same argument about war: I don’t mind fighting battles and hosting casualties as long as I personally have nothing to do with it. Meanwhile, those actually doing the fighting, or civilians caught in the middle, suffer all the trauma associated with modern warfare. So if eating meat is physically harmful (of that point I’m convinced), and it’s potentially psychologically harmful (possibly to me, probably to others), then that seems like a pretty good reason to give it up. And it’s pretty bad for the only planet we currently occupy, so there’s that, too. What would it take to get me to stop eating meat? It’s not really about replacement meat, for me. If I go vegetarian, I’m not interested in choking down an entire box of frozen gluten patties shaped like hamberders. What’s difficult is that every now and then I crave meat. Beef, specifically. And chicken and turkey and all that are so convenient, when you want to feel full quickly, easily, cheaply (thanks, meat subsidies!). And when you’re hungry already, your willpower is basically dead. But if I think about these sorts of food choices as a series of compounding harms, rather than just a pointless choice, I might start taking seriously the idea of staying meatless. This entry was posted in Record and tagged animals, ethics, hamberders, Kant, meat, meatless, psychology, vegan, vegetarian. Your vegetarian philosophy student wife agrees!